Water is a human right and should be a public service. But did you know how much it boosts private profits of the country’s richest oligarchs? Famously known for their malls and condominiums in urban centers across the country, the Ayala family has interests in many other sectors. This includes privatized water services through Ayala Corporation’s subsidiary Manila Water. The water service provider’s net income more than doubled (137% growth) in the last decade, reaching Php6.6 billion in 2018, before falling into controversy for water shortages affecting millions of Metro Manila residents. The Ayalas have significant interests in real estate with Ayala Land’s net income growing by 16% to Php29.2 billion in 2018. The company tagline is “Enhancing land, enriching lives” but many Ayala projects are notorious for violent demolitions of urban poor communities, such as to clear the North Triangle EDSA area, and for displacing agrarian reform beneficiaries. They have also cashed in on Duterte’s Build Build Build program and bagged infrastructure deals like the Php4 billion Taguig Integrated Terminal. 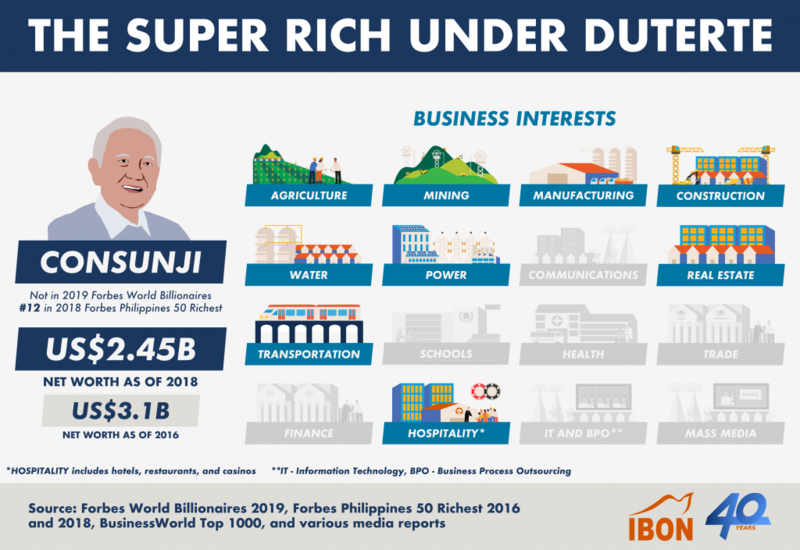 Construction giant David Consunji is the 12th richest Filipino, according to Forbes magazine. 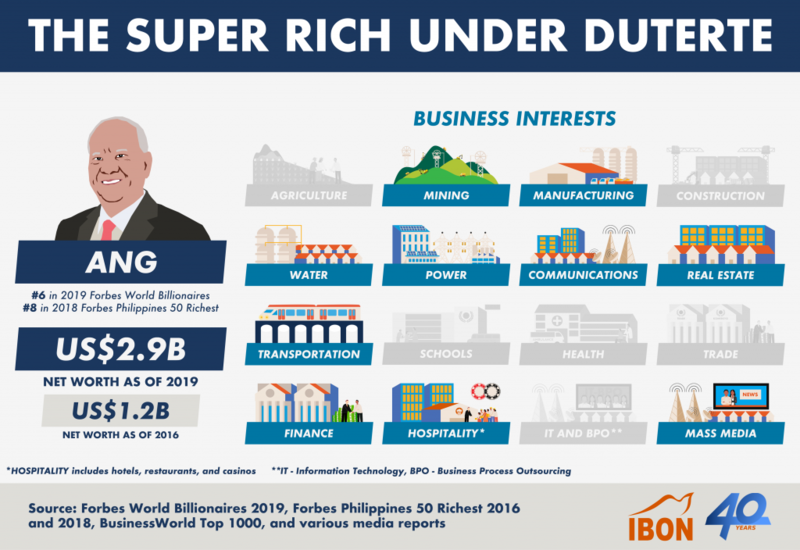 He owns one-fourth (25%) of Maynilad Water whose net income from privatized water services grew five-fold (423%) from Php1.3 billion in 2007 to Php 6.8 billion in 2017. Consunji founded DMCI Holdings which was a key player in building the Makati and Ortigas business districts. His family bagged several Build Build Build projects, including the Laguna segment of the Php35.4 billion Cavite-Laguna Expressway. 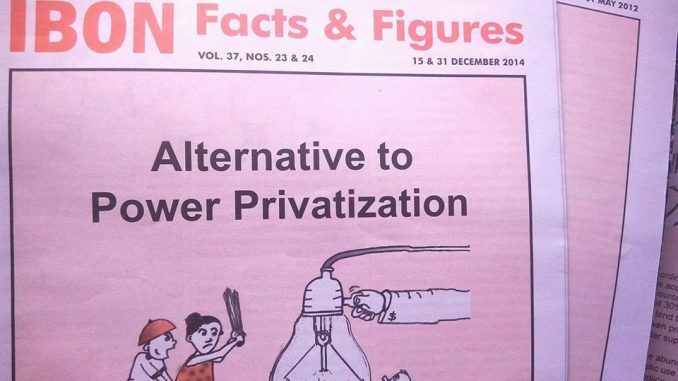 The Consunjis also have stakes in power generation, real estate, infastructure, and mining. 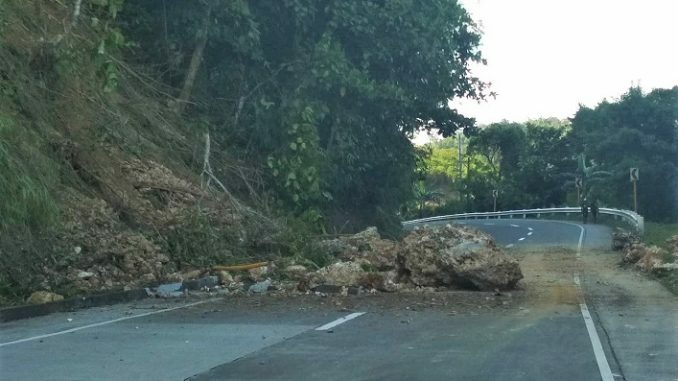 Speaking of mining, DMCI Holdings’ subsidiary Semirara Mining and Power Corporation (which grossed Php42 billion in 2018) has been repeatedly implicated in mining disasters. Nine miners were reportedly killed when their Panian open mine pit collapsed in 2015. More recently, another accident in their Molave open pit in 2018 reportedly killed a worker and injured two others. 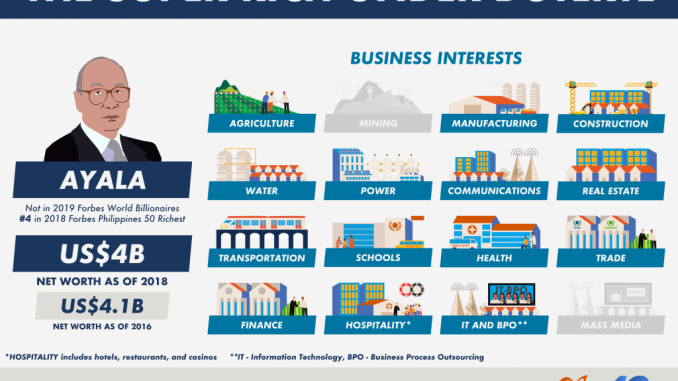 Ramon Ang is president and chief executive officer of Top Frontier Investment Holdings, which is San Miguel Corporation’s (SMC) largest shareholder. SMC has interests in the water sector through the Php24.4 billion Bulacan Bulk Water Supply Project, a public-private partnership with the Korean firm K-Water Resources Corporation. SMC is the Philippine’s largest corporation and is among the most diversified conglomerates with stakes in food and beverage, packaging, property development, tollways, rail, oil, power generation, manufacturing, ports and banking. Named as one of Duterte’s campaign donors, Ang (through SMC) has also bagged multiple projects under the Build Build Build program. These include the Php62.7 billion MRT Line 7 and the Php24.2 billion Tarlac-Pangasinan-La Union Expressway. The company is not without controversy. For instance, communities around SMC’s Consolidated Power Corporation’s 300-megawatt coal-fired power plant in Limay, Bataan are asking for this to be shut down for being harmful to their health and the environment. 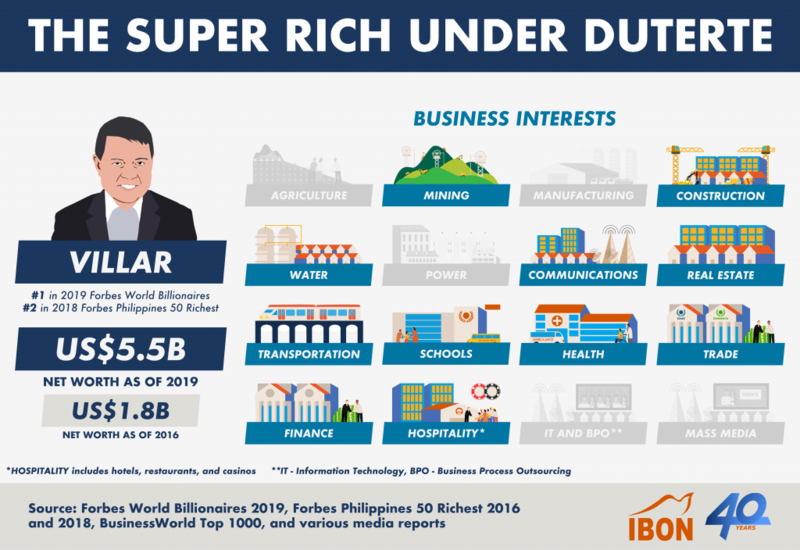 Manny Villar, real estate magnate and former senator, has gone from swimming in a sea of garbage to becoming the Philippines’ richest person according to Forbes magazine. Part of his wealth comes from privatized water services – his PrimeWater Infrastructure Corp. has aggressively expanded in the last few years to more than 37 local water district nationwide. But Villar’s wealth really came from real estate and property development through his Golden Bria Holdings and Vista Land & Lifescapes. He also operates malls through Starmalls, Inc.
His wife Cynthia is currently running as a reelectionist for the Senate, while his son Mark is part of Duterte’s cabinet as the secretary of the Department of Public Works and Highways. In 2009, Villar made headlines by being accused of diverting public infrastructure to benefit his family’s business real estate projects.